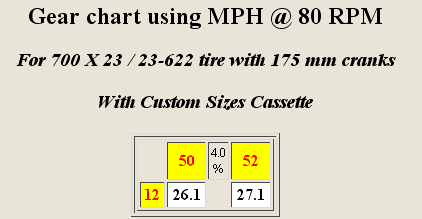 With the advantage only growing for the 52t triple ring as the RPMs increase, my work was cut out. Ample nutrition was positioned on a table between us. No one would starve today. 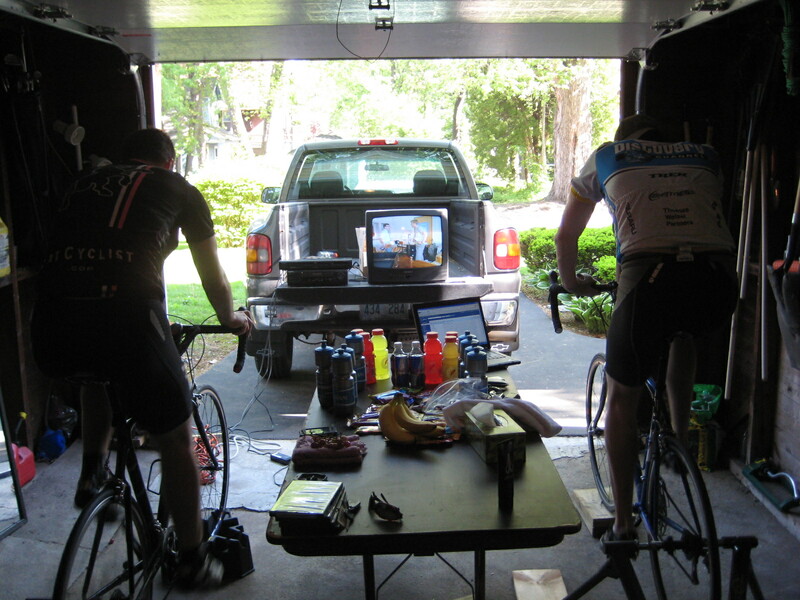 The DVD was on the fritz, leaving us with VHS to light the way to 100 miles. Revenge of the Nerds inserted, we were off at 8:36AM. Right away I’m totally screwed. Normal rules make no sense in the 100 Miles of Nowhere. I am spinning well north of 100rpm; absolute concentration is required to synchronize with the pawls in the freewheel and actually feel like you are doing work. My wheel setup is much lighter than Andy’s, but this would not be an advantage today. Andy’s greater rotating wheel mass, plus his taller gearing combined with pure raw ability to go nowhere make him a dynamo. My greatest short-burst effort put the wheel north of 66mph; Andy completely obliterates this mark as he tops out at an incredible 72.8mph. So you guys didn’t take any heat for going freewheel? My buddy and I thought about that but worried that it may go against the spirit of the event. 3 hours sounds much more appealing than 5+. Great write up! Way to go guys! My ride is tomorrow morning starting at 5:30AM. Nice work guys! I just got back from my 100 Miles of Nowhere in Qatar. Temps hit about 104F by the end of it, but I made it, first century ever. Love the writeup, keep up the good work! Totally Awesome! Hats off for doing something out of the ordinary. So many people worried about ‘rules’ and ‘spirit’ of an event that had no rules. The spirit of the thing was signing up and participating in any way. This is the most interesting so far. I myself gave the ride an entire skip, went to the Y, and <>swam<> 100 <>Laps<> of Nowhere instead. I really liked the way Chris got 34.9 miles per gallon!! That CarboRocket must be good stuff. 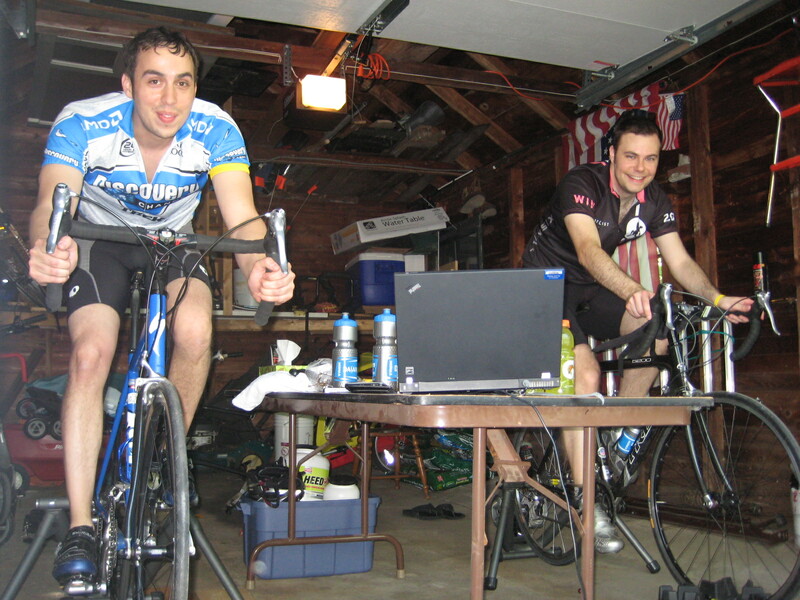 To our credit, neither of us had ever ridden a trainer with resistance off, and we had grossly overestimated the work. We both had set aside at least 6 hrs to complete it the task. I think reality struck us when we hopped on and realized that you could, in short bursts, bring your speed up to something short of a Ferarri. Next year we are definitely finding a track for this event. Either way, we still raised some dough for a worthwhile cause.